They said it couldn't happen... Me and the misses were upstairs counting my blog money. (Sometimes I even like to roll around in it after a hard days work linking.) We were discussing our various options for redecorating - I especially wanted to get rid of that made-in-china-faux-American-traditional-knockoff-metal corner shelfy thing. My wife had bought that black metal shelf as a way to trick thieves into thinking there was nothing of value in the house. (As you will see that didn't work out too good.) We were also considering some dark green carpeting to go with the money theme I was developing, but I digress. So, I grabbed my trusty Smith & Wesson M&P9 equipped with both a Crimson Trace Lasergrip and the new Lightguard. I proceeded in a high speed, low drag tactical sashay to the top of the stairs. Oh noes! Ninjas! Ninjas intent on executing an unscheduled estate appraisal! Given there were five (count them - FIVE!) ninjas in my house, I was glad there were no switches to fumble with and no extra steps introduced when I wanted to be focused on firing my pistol. (I'm really glad that there weren't more than six ninjas - I don't have an aunt Gertrude!) Good news for me is that these Ninjas brought only their hands to a gun fight. I really wish I had put up some sort of mirror system, so I could have caught a glimpse of them around the corner. (I'll add that to the redecorating to do list.) I completed a combat roll to get into position and yelled, "Geronimo! Don't you know who I am? Also, I have a gun! And I've called 911!" I pulled a chaise lounge in front of the stairs in order to have some sort of barrier object to take cover behind. 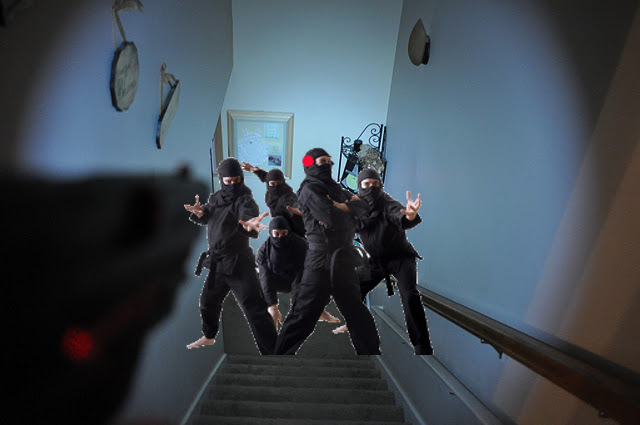 At this point, I realized that one of the ninjas was a little person and I really regretted installing the redundant/auxiliary hand rail along the stairs. I won't bore you with the details (but if Larry wants to write some up, I'll insert them here - feel free to spice it up with grenades, claymores, and tactical bats), but suffice it to say that I dispatched the ninjas with extreme prejudice. Unfortunately, the light fixture was a victim of friendly fire. What would I do differently? Really, not much given the positive outcome. Maybe some day I might pick up a Ninja Glock just for this sort of occasion. A last note - no cats were harmed during the course of these events. No offense was intended to persons real or from the internet. This thing basically wrote itself here, here, and here. It's a good thing my coffee cup was empty when I read this. @A Horse Thief - I'm glad you liked it. @LC Scotty - good point. Shooting poor crippled footless ninjas like that! No boobies?? Whenever an article starts out along the lines of "I never thought this kind of thing would happen to me", I'm expecting Penthouse Letters material. @Linoge - I was going for funny. I think Uncle liked it, so I'm sticking with funny. @Hans - my Photoshop-fu is weak. (Actually, my GIMP-fu is weak.) I thought everyone would focus on the cool red dot I put on the ninja's head. @Anon - I think you are looking for the BrickoLore After Dark website. @Thomas - if they had been holding "We are the 99%" then I would have been much more sympathetic.